MV Red Osprey was one of two identical vessels ordered in 1993 from Ferguson Shipbuilders, Port Glasgow - the other being MV Red Falcon. 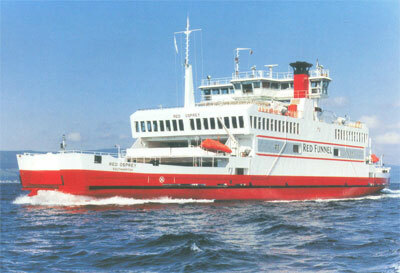 These were doubled-ended ro-ro vehicle ferries with a central bridge affording excellent all-round visibility. They had deployable mezzanine decks which could be deployed in various configurations to improve flexibility. Voith Schneider propulsion gave excellent manoeuvrability, enabling them to turn on their own axis and even move sideways. 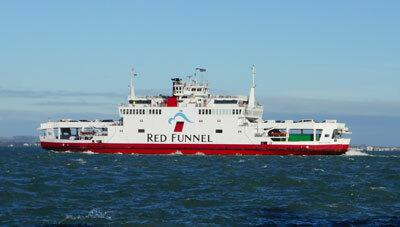 Both vessels entered service in 1994 and were modified in Poland between Jan-Mar 2004 by lengthened and fitted with new car decks - this increased their capacity to approximately 220 cars.